Punchestown lights the touchpaper on what should be another thrilling jumps season with a star-studded card featuring the likes of Death Duty, Minella Rocco, Outlander, Road To Respect and Samcro. Gordon Elliott has wasted no time in getting his winter warriors to the track this autumn and Outlander, winner of the Grade 1 Lexus Chase last year, will begin his campaign in the Grade 3 Irish Daily Star Chase (4.10) under Jack Kennedy. Along with Outlander, Gigginstown House Stud are also represented by Grade 1 novice chase winner Road To Respect and Sub Lieutenant, who has yet to score over three miles. Speaking about Sub Lieutenant, Henry de Bromhead said: “He's in good form and ready to start. He seemed to stay well last season and has run over the trip before, so I don’t think the distance will be a problem for him." JP McManus is doubly represented with Cheltenham Gold Cup runner-up Minella Rocco and five-time Grade 1 winner Carlingford Lough. Racing manager Frank Berry said: “It took a while for the penny to drop with Minella Rocco but he improved throughout the season and he ran a cracker to finish second in the Gold Cup. Jonjo [O’Neill, trainer] reports him to be in good shape and he’s ready to start off. Andy Lynch can barely contain his excitement as he takes the wraps off Zabana for the first time this season. He said: “I’m very happy with him but he’s a much better horse on good ground. The field is completed by John Ryan’s Kilcarry Bridge, an impressive winner of a handicap hurdle last time, but the ten-year-old has a lot to find on ratings. The Grade 3 Buck House Novice Chase (3.40) has attracted only five runners and again Gigginstown are well represented with Death Duty and Tout Est Permis taking each other on. One of the leading novice hurdlers last season, Death Duty won his beginners’ chase at Tipperary just over a fortnight ago, and Elliott expects a good showing from the six-year-old. 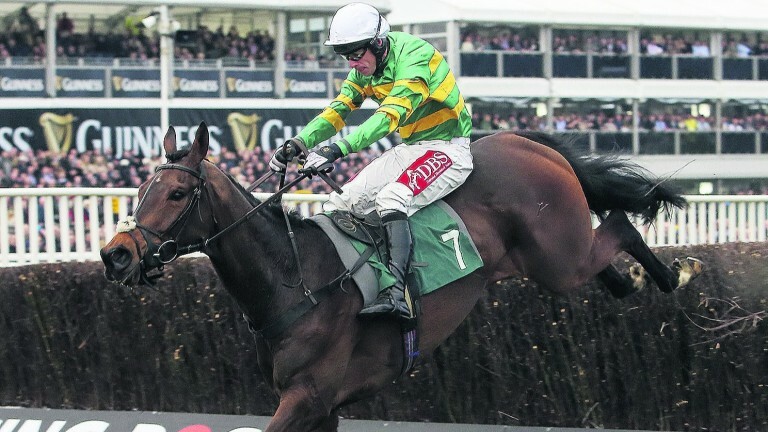 He said: “Chasing was always going to be his game and he did it well at Tipperary. We have been very happy with him since. The Jessica Harrington-trained Woodland Opera, Liam Kenny's A Rated and Three Wise Men, trained by Henry de Bromhead, complete the line-up. If there’s a future star on show it could well be Samcro, who was unbeaten in bumpers last season and has been made ante-post favourite for the Ballymore Novices' Hurdle (formerly the Neptune) at the Cheltenham Festival.